"These cookies are unique in both flavor and texture. Because they are made with powdered sugar instead of granulated sugar, they have a texture that just melts in your mouth. One of our family favorites!" Preheat oven to 375 degrees F (190 degrees C). Line baking sheets with parchment paper, and set aside. Mix the flour, baking soda, and cream of tartar in a bowl. In another bowl, beat the butter and 1 1/2 cups confectioners' sugar together with an electric mixer until light and fluffy. Mix in orange extract, grated orange zest, and egg. Stir in the flour mixture, and blend well. Drop teaspoon-sized portions of dough about 2 inches apart onto the parchment lined baking sheets. The cookies will spread out to about 1 1/2 inches when baked. Bake in the preheated oven for 10 to 14 minutes, until the cookies are light brown. 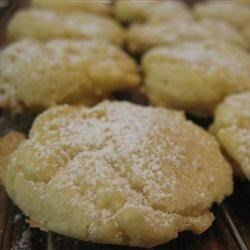 Remove from the oven, and sift remaining confectioners' sugar onto the hot cookies. Allow to cool, and store in an airtight container. I made these using twice the amount of orange exract called for and it was delicious! I baked for 8-10 minutes. Any more than that and they can burn. crispy outside, and soft flaky center. As others suggested, I double the orange extract to 2 t and also went a bit heavy on the grated orange zest. The cookies have a good flavor and are a nice break from the "old standards" cookies. Made this for Christmas. Easy to make and soft, but I would have preferred a more orangey taste. I'm going to try it with more orange extract. after reader the other reviews I added twice the amount of extract. They are soft tender and really do just melt in your mouth. I can't wait to try this recipe with some lemon or lime!!!! excellent little cookies! were loved by all. will definitely make again.